One of my favorite dim sum dish is the Daikon It is often called Turnip Cake, but because daikon is the main ingredient, I like to call it Daikon Cake. It is a traditional southeastern Chinese dish, and the recipe here is a traditional Taiwanese version of the recipe which requires fewer ingredients in contrast to Cantonese style (this is what you find at dim sum). Nonetheless, this is the best way to bring out the the nature sweet flavor of daikon. Salt: 1.5 teaspoons. It can go up or down based on personal preference, but it is a good idea to keep it below 2 teaspoons. Sugar: 2 teaspoons. I use white sugar or castor sugar too keep all ingredients white. White pepper: 1 teaspoon. This is optional. Black pepper is okay also. Skinned and shredded daikon: 800 to 900g. Here is how you cook it. Mix the dry ingredients in Ingredient Set 1 first. Then slowly add in water to evenly mix everything in ingredients set 1 together. Put Ingredients Set 2 in a big pot and bring it to a boil. Let it boil until the shredded daikon is soften. Usually, this takes about 5 minutes after boil. 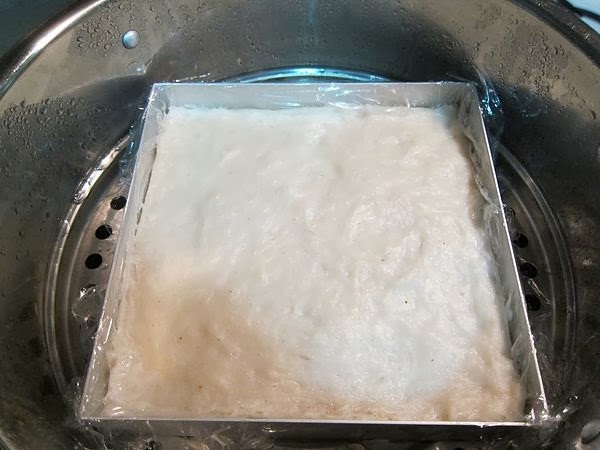 Prepare a container/pot that can be fitted in the steamer by applying a thin layer of oil at the inner of the container/pot for easy removal of the daikon cake when it is done. I use baking pan or oven safe glass container. 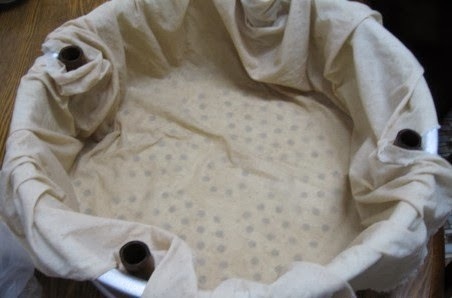 In my family, sometimes we lay a wet unbleached cotton sheet over the whole steamer as the container. In the image, there are some tubes at the side. It is important to have those tubes so the steam can pass through to cook the whole cake. Pour mixture of Ingredient Set 1 in first in the the container. Then slowly pour in the cooked shredded daikon and water from step 2 into the container. Mix/blend with the everything evenly. This may require 3 to 4 pours. The best tool to blend everything evenly is a handful of chopsticks. I use 4 to 5 chopsticks at a time. However, you can use any tool you like to make it happen. Once everything is evenly mixed flatten the top and close the lid for the steamer. Use middle to high heat for the steamer and steam for 70 to 80 minutes. To test if the daikon cake is fully cook, use a chopstick to poke in the center. 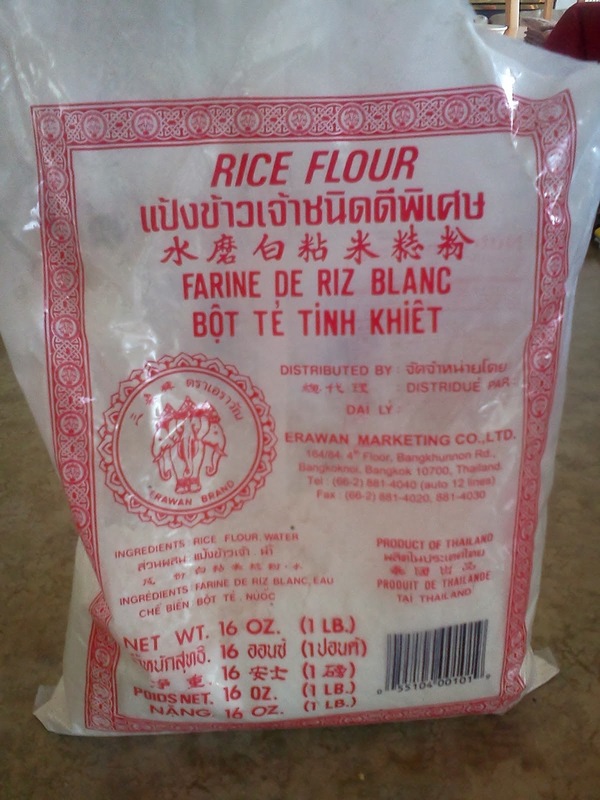 If it is fully cooked, no rice flour should stick to the chopstick. Add 10 more minutes if the daikon cake is not fully cooked. Repeat this step if necessary. Then the daikon cake is ready to be sliced and eaten! 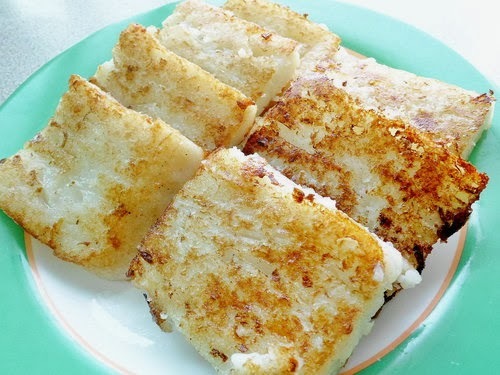 To enhance the flavor, it is common to pan fried the daikon cake before serving. Of course, dressing the daikon cake with thick soy sauce can bring out the best out of this daikon cake.